The Lenovo K900 just got unveiled for the Indian audience, and this was expected since there was quite a bit of buzz surrounding this high powered device. The K900 does not come with an octa-core processor or the likes, but it makes the point in it’s own unique way thanks to the Intel Clover Trail+ series of processors which is being used in this device. The device has its own share of competitor’s in the form of Samsung Galaxy S4, HTC One, and the likes. Let us go ahead with the quick review based on the specifications of this new powerhouse. Keeping up with the trends, Lenovo has included a 13MP rear shooter, which should be good enough in terms of sheer number of pixels. The overall quality would also depend upon the aperture of the lens being used, and how well the software is optimized to utilize the hardware. When talking about the front camera, the K900 sports a 2MP front shooter, which, although isn’t over the top by today’s standards, should do well enough for your video calling needs. The phone comes with 16GB of on-board storage out of which quite a chunk is taken up by the OS and reserved for apps, and the user ultimately is left with 8.8GB for file storage. However, there is a microSD card slot which lets you expand the storage using microSD cards of up to 32GB in size. Thus, storage shouldn’t be a problem. This is one segment where Lenovo has managed to have some bragging rights. The phone comes with a 2GHz Intel Atom Z2580 which is a dual-core processor and probably won’t keep you asking for more. 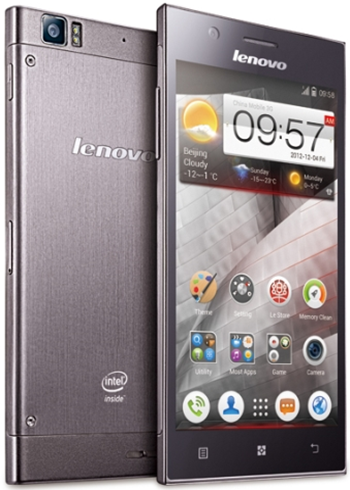 The processor and build of this phone are the USP, and we ought to agree with Lenovo here. Intel is a well-established manufacturer of chipsets for computers, and we expect nothing but perfection from them when it comes to mobile computing as well. Intel had done a great job with the XOLO X900 as well, it come from nowhere and challenged the top phones from that time. This makes us look forward to using the Lenovo K900 as well. To further complement the powerful processor, the Lenovo has 2GB of RAM which means multitasking would be nothing less than a breeze, even with many memory-intensive applications running in the background. The battery of this phone is rated 2500mAh, which should take you through on work day but do not expect any miracles. With a processor as powerful as the Z2580, you can expect it to be power-hungry at the same time. Thus, it would be wise to have a spare charger just in case. The screen of this phone measures a hefty 5.5 inches, which again will prove to be a battery-monger. If you get battery backup of anything more than 10-12hrs, consider yourself lucky. The device comes under the category of ‘phablets’ thanks to the huge 5.5 inch screen. The 5.5 inch panel comes with a full HD resolution of 1920×1080 pixels, which means the phone will have a high pixel density and will be a treat for the eye. Reading as well as multimedia will be fun thanks to the display, although you might have to worry about saving the battery at times. The K900 has been priced at 32,995 INR for the Indian market, and should be available soon. Some might have apprehensions buying from a manufacturer not widely known to produce great cell phones, but let us advice you that the phone looks worth it. At least the specs sheet the phone carries along with it is worth paying the price tag’s worth. The only catch can be the battery for some, but with firmware updates you can expect the backup to get better with time. Sure about expandable memory? Hands on video’s say otherwise..
you do not have SD card support on this device, the back cover has screws which are supposed to be opened at the time of service or issue. 1)how is the voice and call quality .Also comment on the signal strength of network wrt other phones. 2)is there issue of over heating on account of battery usage for simple ops like calling or video watching. Does it become too hot even to hold on hands…Pls share ur views on this. we have the device now with us and will be coming soon with full detailed review of the device, just wait for a week approx for the full review to be posted on the website.